Animal hides, including leather and leather strips, are traded by blacksmiths (including quartermasters) and by hunters encountered in the wilderness. Giants are also a good source of hides -- they will drop up to 3 random, level-dependent hides. Tanning Transformations provides full details on how each of these hides/pelts are converted into leather, including gold and weight differences. Dropped by Bears, including Spriggan companion Bears and the bear encountered in the quest Unbound (but not including Snow Bears or Cave Bears). May be sold by hunters and general goods merchants starting at level 1. 10 Bear Pelts (of any variety) are needed for the quest Grin and Bear It. A Bear Pelt is one of four ingredients needed to create a Spell Tome: Conjure Flame Atronach at the Atronach Forge. If Hearthfire is installed, it is used for various furnishing options for your player-built home. Dropped by Cave Bears, including Spriggan companion Cave Bears. May be sold by hunters and general goods merchants starting at level 8. 14 guaranteed pelts found in 12 different locations. The only location with multiple Cave Bear Pelts is Cliffside Retreat (The Reach) with 3. Dropped by all varieties of Cow (although killing someone's cow may be considered a Crime). Not sold by hunters, but may be sold by general goods merchants. The first variety (0003ad90) is dropped by Elk; the second variety (000D284D) is dropped by Deer. The two varieties are different visually from one another. 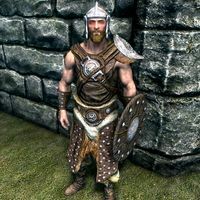 This issue has been addressed by version 2.0.6 of the Unofficial Skyrim Patch; it changes the display name of the first variety to "Elk Hide". Only the Elk-dropped version of Deer Hide is possibly sold by hunters and general goods merchants (starting at level 1). Deer do not drop Deer Pelts (they drop Deer Hides instead). Deer Pelts cannot be tanned into leather, and are not used in any crafting recipes. This issue has been addressed by version 3.0.11 of the Unofficial Skyrim Legendary Edition Patch; it adds a crafting recipe that lets it be tanned into 1 leather. Dropped by Foxes, including Pumpkin (but not including Snow Foxes). 33% chance of being dropped by all varieties of Goat (who will otherwise drop Leg of Goat or minor loot). 2 Goat Hides produce 1 Leather -- this is the only case where more than one hide is necessary for tanning. 33% chance of being dropped by all varieties of Horse (who will otherwise drop Horse Meat or minor loot). Dropped by Ice Wolves, including Spriggan companion Ice Wolves and various Wolf Spirits. May be sold by hunters and general goods merchants starting at level 5. An Ice Wolf Pelt is one of four ingredients needed to create a Spell Tome: Conjure Frost Atronach at the Atronach Forge. This item is incorrectly translated as "Wolfspelz" (Wolf Pelt). Dropped by Sabre Cats, including Spriggan companion Sabre Cats. Dropped by Snowy Sabre Cats, including Spriggan companion Snowy Sabre Cats. May be sold by hunters and general goods merchants starting at level 10. This item is incorrectly translated as "Säbelzahntigerpelz" (Sabre Cat Pelt). Quest item dropped by the werewolf Sinding as part of the quest Ill Met By Moonlight. Dropped by Snow Bears, including Spriggan companion Bears and the Ursine Guardian. Only available with the Dawnguard add-on. Dropped by Vale Sabre Cats. Werewolf Pelts are not available in the original version of the game, and cannot be tanned. This issue has been addressed by version 3.0.10 of the Unofficial Skyrim Legendary Edition Patch; a crafting recipe was created so that they can be tanned into 1 leather. One is available with the Dawnguard add-on. Can be found in Volkihar Keep in Harkon's quarters. Severalhow many? can be found at the necromancer camp northwest of Folgunthur with the Bone Wolf Creation installed. Dropped by Wolves, including Pit Wolves, but not by Werewolves or Ice Wolves. May be sold by hunters or general goods merchants starting at level 1. Produced by tanning nearly any hide or pelt; see above or Tanning Transformations for more information. All blacksmiths are guaranteed to have 10-27 leather in stock. 1 Leather produces 4 Leather Strips. 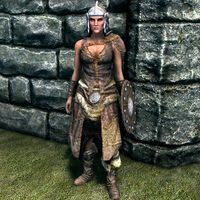 Leather is needed at Forges to create all varieties of light armor, as well as some varieties of heavy armor (in particular, Ancient Nord armor). Leather is needed at Workbenches to improve most varieties of light armor, including fur, hide, leather, and shrouded armor. Produced by tanning leather; 1 Leather produces 4 Leather Strips. All blacksmiths are guaranteed to have 12-33 leather strips in stock; general goods merchants may also stock 10-40. Certain cupboards have a 15% chance of containing 10-40 leather strips. 1 Leather Strip is needed at Grindstones to improve Hunting Bows. 2 Leather Strips (plus 1 Leather) are needed at Workbenches to improve the Gloves of the Pugilist. These items are also categorized as armor, so blacksmiths would buy them even if they weren't in the animal hides category. Several varieties of low-quality light armor can be crafted either exclusively or primarily out of leather. These items can be forged from the start of the game, without the need to unlock any Smithing perks. This also means that only normal-level tempering of these armor types is possible (there is no perk that provides the ability to "improve them twice as much"). Fur Armor is not listed here because it cannot be crafted by the player. These derived armor pieces are no longer categorized as animal hides by merchants, but are instead categorized as armor (the only implication being that Hunters will not buy them). Hide is the lowest-quality light armor in the game, providing even less protection than Fur Armor, and appears in leveled lists at the start of the game. All items can be tempered using 1 Leather. 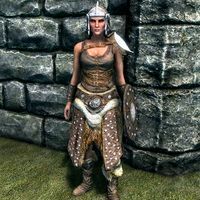 There is little reason to craft any of these armor pieces, because with the exact same materials you can instead craft better-quality Leather Armor, with the exception of the shield (for which there is no leather equivalent). Studded armor is only available in a cuirass, which provides slightly more protection than the Hide armor equivalent. It appears in leveled lists at the start of the game, and can be tempered using 1 Iron Ingot. Crafting Studded Armor uses the exact same amount of leather as either Hide Armor or Leather Armor, but also requires one Iron Ingot. 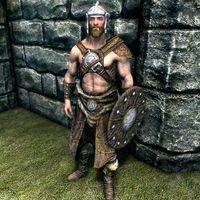 Given that Leather Armor is better quality and requires fewer materials, there is little reason to craft Studded Armor. 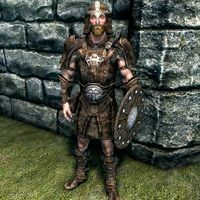 Leather Armor is better than Hide, Fur, or Studded armors, but is still a relatively low-quality type of light armor. It appears in leveled lists starting at level 6 (enchanted varieties at level 7). All items can be tempered using 1 Leather. 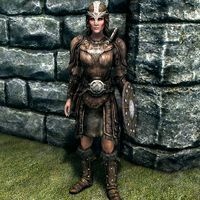 Since Leather Armor uses only Leather and Leather Strips, this may be a good light armor set to craft for yourself early on. This page was last modified on 22 November 2018, at 03:44.